Stir olive oil and lemon pepper together in a bowl. Fry the chicken wings in hot oil until no longer pink at the bone and the juices run clear, about 8 minutes. An instant-read thermometer inserted near the bone should read 165 degrees F (74 degrees C). Toss hot wings with olive oil mixture to coat. 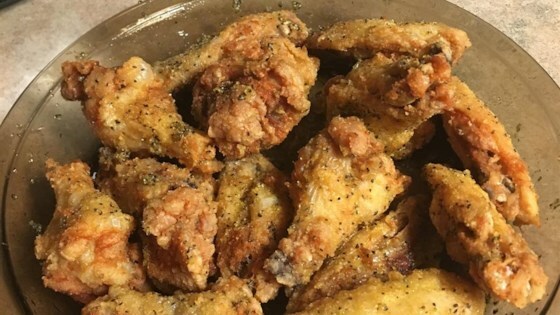 Delicious chicken wings perfect for the next football party or just because! This recipe is a big hit. My husband loved it. I had to had a tad more olive oil to mix the lemon pepper better. I follow the recipe and they were wonderful...next time i will try light flour on them. Wanted some great lemon pepper wings for football and these hit the spot! Hubby loved them too! Will be making these again.